Photo spreads can be fun to look at, but when you have an A4 scanner, it's often impossible to scan them completely. You have to make partial scans and merge those scans later. 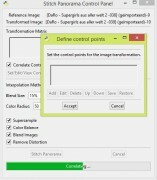 That merging can be done with Microsoft Research Image Composite Editor (ICE). It's freeware and you can get it here. Before you start, make sure your scans have a considerable overlap, about 20%. then launch ICE. Now Microsoft ICE is great, but it does need a lot of overlap. When scanning large magazines on an A4 scanner you don't get enough overlap. In that case you need software that joins pics using reference points that you choose. 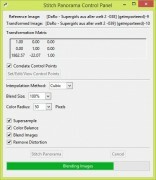 For example the Gimp with the Stitch Panorama plugin. Both are freeware. At the Stitch Panorama link you find a manual under Documentation. If this manual works for you, by all means use it. But if it doesn't, like in my case, this guide may help you to get the result you want. 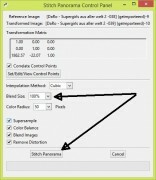 Before starting, make sure that the Gimp and Stitch Panorama have been installed correctly. I supppose you know how to to do that. First of all, open the images you want to stitch in the Gimp and put them next to each other. In the Gimp you can make multiple selections by pressing the Shift button. So press the Shift button, make a selection of the chosen reference point and then make another selection anywhere in the same image. Reason for this is that the last selection may disappear when you make a selection of the reference point in the other image. Then start Stitch Panorama. It's probably under Filters>Utilities and it will be greyed out when no image is opened. The 'Define coltrol points' dialogue appears. Click on 'Add'. This will add the two selections you made previously. Stitch Panorama starts working on the reference points. The time this takes depends on the speed of your computer and the size of the selections you have made. After a while you get something like this. Click on 'Accept'. Stitch Panorama will now merge the two images. The time this takes depends on the speed of your computer, the chosen settings and the size of the images. Not what you want, so select the layer with the large black mask and go to Layer>Mask>Remove Layer Mask. Much better. Now select Image>Flatten image, or something to that extent. After that you can save or export the image. Note 1: it should be possible to make multiple selections of reference points, but I have never managed to do that. And given the result it does not seem te be necessary. Note 2: Some processes take a lot of CPU time. You could greatly reduce that time by making smaller selections of the reference points. You have to try yourself. I haven't bothered, because I just got a new computer anyway. 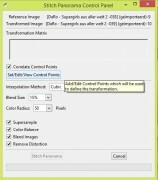 Another suggestion: Photoshop Elements and its photomerge panorama function. The software is obviously commercial, but not that expensive, is much better than the Gimp crap and you can use it to adjust other things in your scans. Gimp is not crap. Your opinion. Not fact. Thanks for the heads-up on ICE, an interesting program - shame it's been discontinued. Some have had problems running it on Win 10, but my main Pron PC is Win 7, so will have a play with it there. Agree with Verdegris, IrfanView is my favorite SlideShow program as it can be 'windowed' to part of ones screen to allow other things going on... Almost too many options in IrfranView!